A small business website is ‘must have’ for entrepreneurs, small businesses and anyone who wants to sell products or services online. There are numerous ways to market yourself but having a website that can be seen on the web is a sure fire way of reaching a wider audience and getting yourself and your company noticed. If you are in the business of selling, then this serves as an extension of you. It is a portal for any prospective client to learn about what you or your business offers. It provides credibility and a source of relevant content. Ultimately it helps customers to decide whether to work with you or not. So if you have a business and now you need to build a website, you can either employ a professional or do-it-yourself. Firstly you need to decide what your website is going to do for you. For example you might want to sell products or services online. So, the call to action will need to drive your customers to make a purchase or to make contact and hire you. Or it may be you need a fairly simple website like a brochure site or online CV. You’ll need to focus on your capabilities, qualifications and services that might be of interest to your audience. You may want to set up a blog and talk about your chosen niche as well. Remember that you will get more out of your site if it is a living breathing entity. A static site won’t generate quite as much interest or traffic as a site that has content that is added to on a regular basis. So the addition of a blog or news page will really enhance your social media capabilities and increase your chances of connecting with your audience. Essentially it’s a simple diagram that can easily be changed, moved around and added to as your site develops. It is where you get to plan your site’s layout and the basic content that you want to include. Start with your homepage and then include things like an about us page, contact page, a blog and a services page if appropriate. Also include any other pages that outline what you do or sell. The easiest way to visualize it, is to lay out each page in grid. Put the homepage on the first level with any direct links like about us on a secondary level. If you intend to have a large site, you will no doubt need a third level that incorporates a drop-down menu. Sometimes it’s a good idea to add notes to pages that include a specific function or call-to-action. 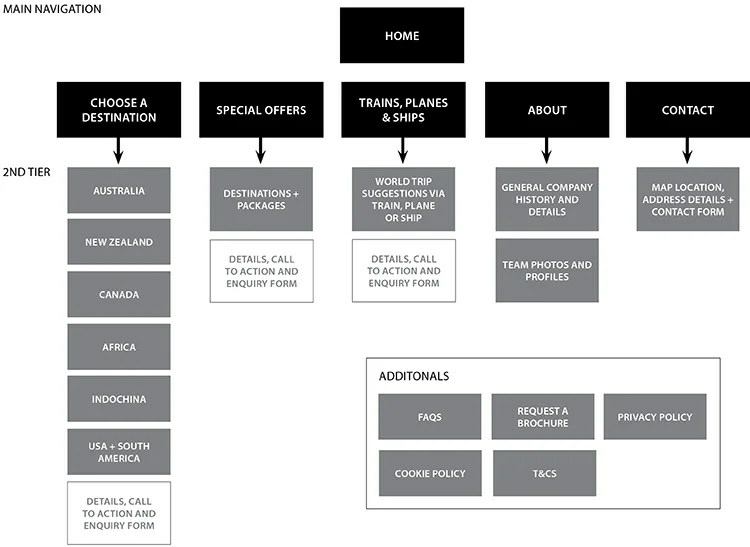 This helps you or your web designer to know what will happen on that page and what the end task is. With so many options out there it can be difficult to choose. Some require a good level of technical expertise to setup so this should be considered before you venture forwards. If you want to build a simple blog, you could consider Tumblr which is easy to setup and is one of the leading blogging platforms. There are plenty of templates to choose from and a thriving community. However if you want a custom url then this isn’t the option for you as it will include tumblr.com in the name. Others to consider are WordPress and Blogger. If you intend to sell products of some kind then it is a good idea to use software designed specifically for e-commerce. However if e-commerce is only a small part of your business then you could consider using an add-on with WordPress. More on that one below. My preference is to use WordPress which is a popular and easy-to-use content management system. There are plenty of excellent themes, some free and some paid for, and numerous useful plugins that add functionality. These plugins can enable you to add things like security features, social media linking, picture galleries, web forms, e-commerce, font management and more. You can browse many of these free plugins via the Plugin Directory or search for one within the WordPress admin panel. The beauty with this platform is that you can setup your homepage as a blog or as an online shop or services facing website. There are many customizable features and you can, with some knowledge, create a good looking site. Most web hosts also offer a one-click install which is a big bonus. If not then you’ll be required to upload WordPress plus create a MySQL database separately. If you feel WordPress isn’t right for you then there are a few other DIY website providers out there. One of the most commonly used is SquareSpace and they offer the full hosting and domain package plus have plenty of templates for you to choose from. Looking professional is always a good idea so I’d certainly consider using a custom domain rather than a free hosted url. A custom url can be tailored more closely to your company name and even include a target keyword. So for instance if you are called Sue and you run a cake shop, you could try something like suescakeshop or greatcakesonline. You will stand more chance of getting a good site ranking if you can include a relevant keyword. It is a good idea to use the same company for both registering your domain name and for hosting your website. This will make the process of transferring your site to another server much easier should you change your mind in the future. If possible I would recommend purchasing a .com address as it is generally regarded with more authority and has global appeal. Failing that a .net is a good option. However there are many more options available to business owners, so choose what works for you. There are numerous options on offer for when it comes to hosting your website, and can cost as little as $2 per month. It is worth choosing a reputable company though so you may want to do a little research first. Make sure they have a good customer service department and offer a free or local telephone number for support. Some offer online chat facilities which I’ve used and this can be a great time saver if you have a problem. Free web hosting can be a good choice when you just want to build a website for fun. However in a free hosting environment, connection speed can be slow, websites can be down frequently, and advertising banners are automatically added to your site. So not ideal. For shared hosting, your website and other site owners share a single server. This includes sharing the physical server and the software applications. Shared hosting services are very affordable because the cost to operate the server is shared between you and other owners. Depending on who you use, your site may run slowly. I currently use this service and have been pleased with the site speed so far. If you require a higher level of security or provide a lot of resources then dedicated hosting is for you. This gives you your own dedicated server and allows a faster performance. However, this also means that you will be responsible for the cost of server operation entirely – which can be more costly. Now comes the fun part. Unless you have access to a web designer who can create and build a bespoke site for you, the easiest way to design a website is to use a template or theme. There are thousands of themes in the market place which are specific to your industry – some of which are free. FREE I hear you scream! Yes but they are usually free for a reason and are poorly coded and have zero support. So my preference would be to choose a good WordPress theme that matches your business type, has good buyer reviews and has a good support structure. Also check to see if it is a responsive design as you’ll want it to work on mobiles phones, tablet devices and desktop computers. Up until now I’ve used Theme Forest which offers plenty of premium themes for around $45 and has a pretty good track record. Others include Woo Themes which offer excellent designs and have a good range of e-commerce templates to use. And if you really want to have the full ability to customise your site then you could consider the Genesis framework. Regardless of whether you intend to create a small business website, a site for a sole trader offering services or an e-commerce website for a company selling products, there will be a template available for you to use and customise. Once WordPress has been installed (this includes a MySQL database), you can access the theme settings within minutes and start customising your design with your logo, colour, fonts, images and text. Now your new website theme is installed, you can add the all important content. With WordPress you have the advantage of using a WYSIWYG text editor. You can even copy and paste in text from Microsoft Word and other desktop packages. If you don’t have the facility to put your site on to a test environment, I’d recommend adding a ‘website under construction’ plugin. This uploads a temporary page to which you can add some basic contact details to. It also offers you the benefit to work on your design and layout without the big wide world seeing your site until you are ready to launch. You may already have a logo and brand identity in place. If not then this is something you will definitely need to create. If you don’t have the budget to employ a professional logo designer, then consider using People Per Hour where you can post a job, set a budget and choose a designer to work with. I’ve used and worked with clients on this platform before and it works well. By now you should have some idea as to what you want to say and offer on your site. One of the most important pages will be the design of your homepage. This is the main portal into your business, so spend some time on making it look amazing and unique. Add good quality content that will compel your audience to look deeper into your site. Think ‘focused advertising’ and don’t use long words or jargon that your audience won’t understand. Remember your website is for your audience – NOT you! If you are interested, check out my article on creative ways to market your business. There should be a good balance of text and imagery and remember to include specific searchable keywords that are relevant to your industry. TIP: Each content page should be made up of one H1 title, a few H2 sub-headings and plenty of paragraph body copy – at least 300 words if possible. Important: Have a clear call to action! Not ten, six or three – just one. Keep your customer journey clear and concise. Ensure you have a link or button that clearly directs your audience to continue their journey. If you can, offer your audience a freebie. An e-book is a good idea and a great way to get people to signup to your newsletter by offering it free in return for their email address. Create a blog and post content as regularly as you can – at least once a week. This will ensure your audience will keep returning to your site and will also stay connected to your newsletter. Remember good regular content is great for search engines and it also adds relevant keywords to your site structure. No doubt you’ll want to include some imagery and there are a few royalty free image library sites available. Unless your site is very niche, I’d tend to use Depositphotos and Shutterstock. Both offer good quality images and you can setup a plan which should provide you with a number of quality photos or illustrations to use on your website. If you want to save some money then try PicJumbo or Pixabay, both of which offer some great hi-res images totally free. Once you have your site built and you have added some good, relevant content, you can consider launching your business to the world. If you are running a WordPress site then it’s a good idea to load a few essential plugins. This will ensure your website is secure and runs smoothly. Don’t worry if it isn’t perfect. It never will be, trust me. If possible, view your site on as many different devices as possible. This should include a mobile phone, tablet device and desktop computer (both PC and Apple Mac. You may find some areas of your website doesn’t look quite right and you’ll need to correct these. Get a friend or business colleague to look over your content. An extra pair of eyes is always a good idea and they may provide some useful insights. Try and look at your layout from a customer’s viewpoint. Does the messaging make sense? Is it clear what this website is about? Do I know what I’m meant to do next? By doing this you can ensure your content and site will be viewed correctly, and will look professional. Spend a bit of time getting it to look right that everything looks consistent. Once happy, deactivate your ‘website under construction’ plugin and your site will be live. You have launched your small business website. But that’s not the end. You will periodically be required to update WordPress to the latest version, plus update your theme template when a new version is available. Additionally, any plugins you have installed will also need updating. This is important and all of these updates include important bug fixes and improvements. So don’t forget to login to your site once in a while. 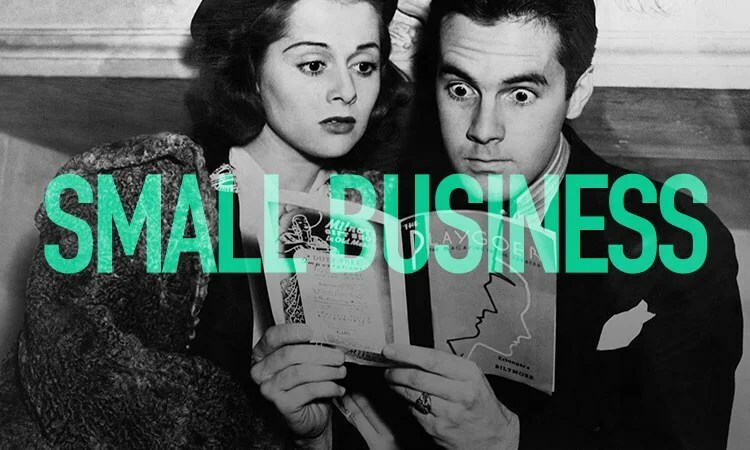 If you enjoyed this article on how to create a small business website please share!